Have you ever wanted to design your own T-shirt? There's no need to bring your original design to a store and pay someone else to put your image onto a shirt. You can make a screen-printing machine at home and create custom T-shirts. These instructions show you how to make a basic screen-printing machine and apply a simple design to a T-shirt. 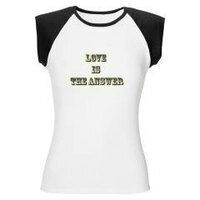 Choose the image, words or graphics to print onto your T-shirt. You can design it on your computer or use a ready-made image that you have permission to reprint. Print your design in the size you want. Stretch a thin, mesh fabric over the inner embroidery hoop. Nylon stockings work well for the thin fabric. It's okay if they run a little, but do not use if they tear. Place the outer hoop over the fabric and inner hoop. Once the two hoops are tightly in place, carefully pull the fabric as tightly as possible. If the fabric tears, you'll need to use a new piece of fabric. Lay the hoops with your fabric facing down over your printed design. Keep the hoops still to prevent movement. Use a heavy object to keep them in place. Trace the outline of your design onto your mesh fabric with a pencil. Use a paintbrush to apply Mod Podge Matte Mat. Fill in the empty spaces within your outline. Allow the Mod Podge to dry. Lay out your T-shirt and place a piece of cardboard in between the two sides. When the Mod Podge has completely dried, lay your screen, fabric down, on the T-shirt in the place where you want your image. Pour a small amount of fabric ink onto the screen. With a piece of cardboard or a spatula, spread the fabric ink over your entire image. When your design is covered, carefully lift the screen from the shirt. Allow the ink on your shirt to dry overnight. Once the shirt is dry, place a piece of paper on top of your design. With you iron set on medium-high heat, iron over the paper for 3 minutes. Lift the paper, and you've just screen-printed your very own T-shirt at home. Use a hairdryer on the cool setting to increase the drying time after applying the Mod Podge. Do not use copyrighted images on your shirts and attempt to sell them. Clean the ink from your screen as soon as possible by running cool water through it in the sink. Rinse your sink immediately to avoid stains.